The Rotary Club of Greenville has once again partnered with the Greenville County School District to recognize a teacher of the year for Greenville County and three runners-up. These four teachers will be recognized at our upcoming meeting on Sept. 25 and have an opportunity to speak briefly to the Club. GCSD Superintendent Dr. Burke Royster will also be present and present remarks. This year’s winners come from each level of secondary education and teach subjects as diverse as language arts, social studies, and manufacturing. 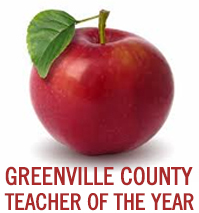 The selection process for GCSD’s teacher of the year began in the fall of 2017, when each school in the District nominated one teacher as the school’s teacher of the year. These nominees then completed applications that were evaluated in the spring, and 10 finalists were selected by five judges. The judges then visited the classrooms of each of the 10 finalists, and conducted an interview with them. One member of the Rotary Club of Greenville serves as a judge, and this year our representative was Wade Kolb, who chairs Rotary’s Teacher of the Year Committee. Our meeting on September 25 will be an entertaining and informative glimpse into the very best of public education in Greenville County, and you might even learn some secrets of superstar teachers along the way! 1, Is it the TRUTH?